I. What is the Friendship system? The Friendship system is like a dating sim type of system inside this game. This system has many benefits which will be listed down below. II. How do I up an NPC’s Affection Bar? An NPC’s affection bar can be increased in three ways: Gifting, Quests, and Conversations. NOTE: The Pink Heart bubble may not show up, so make sure you have accomplished what you need to do to befriend the NPC and check their quests even if there is no Pink Heart bubble. Credits to Lexalise for this information! You can see what you must do to befriend a certain NPC by clicking on their portrait in the Friendship menu(Default Button: Y). Doing certain quest lines will increase NPC’s affection. May has a rather long quest line that boosts her Affection up by like 3% for every quest finished. Irine and Lena will also have quest line sto boost their affection once Saint Haven dungeons have been released. New conversations with NPCs are unlocked once their Friendship rating has reached a certain point. In other words, you MUST do gifts or quests in order to unlock new conversations. Answering correctly for NPC special chats also increases their Affection by ~2% or so. Answering wrongly increases their Aversion rate by 10 ~ 20%. Aversion, in other words, hate, is a bar that increases whenever you do something that the NPC does not like. e.g. Gifting Bailey will increase May’s Aversion bar. Once Aversion reaches 100%, both the Aversion and Affection bar reset to 0%. Aversion drops whenever you gift the NPC. Each gift takes off about 2%(?). I’m not sure if different gifts take off different amounts of Aversion though. IV. When are new Conversations unlocked? I believe that it’s different for each NPC, but make sure you check after gifting them a few times. New conversations will not expire nor will they be overwritten by newer conversations, so it’s unnecessary to pause and check for new conversations in the middle of gifting a large number of items. V. What are the benefits from gifting? I believe it’s random, but gifting an NPC has a chance of that NPC sending you items in the mail. These items include but are not limited to: 3 Crude [Insert any jewel here], 1-3 Iron, 1 Crude Onyx, and 1-3 Amber. Iron and Amber only exist to be sold pretty much. At 30% friendship rating, chat with the NPC and they will give you a gift that holds a special meaning to them, such as Kevin’s Old Goggles or Irine’s Handkerchief. Keeping this special gift in your inventory while gifting to the NPC that gave you this gift will increase the amount of Affection per gift. Their special gifts can be NPC’d for about 1.5g once you have maxed out the NPC’s affection. At 60%, chat with them again and they will give you their Memory Regenerator. These Memory Regenerators, when right clicked, just allow you to hear the NPC’s voice. These sell for around 4.5g at the NPC. Memory Regenerators only take up space, so unless you have a special place in your heart for a certain NPC, then it’s best to just sell off the Memory Regenerator to a NPC. In addition to the above, certain NPCs have side benefits should you befriend them as well. If befriending May, then any items you sell to her will increase in price and any items you buy from her will decrease in price, saving and netting you more money in the long run. Should you choose to befriend Bailey, then the gold cost for crafting Crests and the Dimensional Fragment cost for buying Skill Plate Pouches will lower dramatically, saving you money and allowing you to buy more Skill Plate Pouches for a lower amount of Dimensional Fragments. 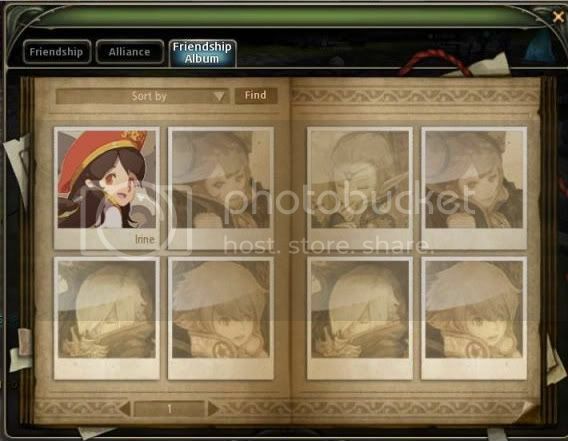 This system, however, has not been implemented in the NA version of Dragon Nest. V. Where can I find gifts? Higher quality Gifts can be found from Dimensional Rabbits at the end of an Abyss run and lower quality Gifts are dropped by mobs in any dungeon run. From what I’ve seen, the gift drop rate from normal mobs is much higher in Masters than it is in Abyss. However, Abyss runs guarantee you at least one higher quality gift from the Dimensional Rabbit at the end. Gifts can also be crafted at the Blacksmith in the “General Goods” section. These crafted gifts are actually what drops in certain dungeons at the end of Abyss runs in the SILVER Dimensional Rabbit’s Box. They also require two lower quality Gifts to make. e.g. Sponge Cake = Honey + Pie Crumbs. Epic tier gifts are acquired from the Splendid Theme Park, which has not been implemented yet in the NA version. Dimensional Rabbit Gifts and Gifts dropped my mobs are specific to a certain “group” of dungeons. Notice how dungeons such as Valley of Mourning and Dead Man’s Road are grouped together in the Dead Man’s Pass’ dungeon select screen? This is what I mean by a “group” of dungeons. NOTE: Gift items will be color coded and these colors will be the same as the border color of the Gift, which represents the quality/tier of the Gift : D Grade, C Grade, B Grade, A Grade. B Grade Gifts will up an NPC’s Affection the most out of all the other potential Gifts, but A Grade items will up an NPC’s Affection and ignore all potential chain reactions at the same time. e.g. Gifting Bailey the Saliana Album Limited Edition will NOT affect Deckard’s Affection bar nor will it affect May’s Aversion bar. Thanks to chaose5 and perfecti for helping me out with information on A Grade gifts! NOTE: Dungeon groups that include dungeons that are level 8 or below will NOT have any mob gift drops, so avoid these areas if trying to farm for easy gifts. These groups with level 8- dungeons will still have Dimensional Bunny drops if there is an Abyss mode in any of the dungeons in the group. e.g. Catacombs Access has both Catacombs (level 5) and Inner Catacombs (level 18) and thus, mobs will not drop any gifts. However, Inner Catacombs has an Abyss Mode and therefore you are able to get gifts from this dungeon from dimensional Rabbits that appear at the end of an Abyss run. After reaching 90% with certain NPCs, talk with them in the chat menu to find a new option. 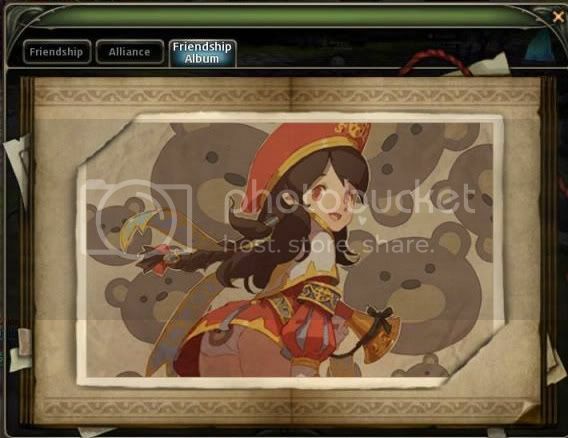 Choosing this option will get you a ‘Bromide’ and once you accept this gift, you will be able to look at the NPC’s special picture any time you want in your Friendship Album. You might have noticed an Alliance tab on your Friendship Menu. This lists out the number of points you have received for gifting NPCs of certain factions. You can click on a certain faction’s section to see what benefits they each give out. There are certain benefits such as being able to trade alliance points for equipment or pouches that contain a wealth of useful items. Each NPC is part of a certain faction and you can see which faction they are in by hovering your mouse over the icon on the top right corner of their entry in the Friendship tab. This is one of the main reasons why you should target certain NPCs over others. NPCs who have no union are usually left out by most players since these NPCs have one less benefit than other NPCs do. e.g. Gifting Lily or Invisible Thief gets you no Alliance Points and thus it would be a better idea to use gifts that target NPCs who are not in Unions on NPCs that are in Unions. A (+) by the name of a NPC will indicate an increase in Affection. A (-) by the name of a NPC will indicate an increase in Aversion.